When a teacher asks the children in her class to think about what makes their families special, the answers are all different in many ways -- but the same in the one way that matters most of all. As one by one, her classmates describe who they live with and who loves them -- family of every shape, size and every kind of relation -- the child realizes that as long as her family is full of caring people, her family is special. 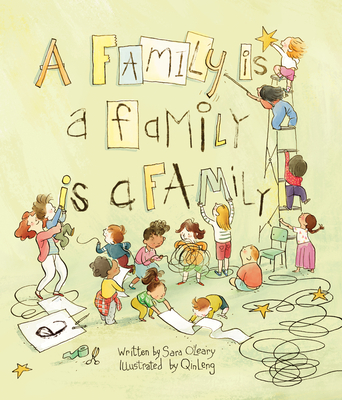 A warm and whimsical look at many types of families written by award-winning author Sara O'Leary, A Family is a Family springs to life with quirky and sweet illustrations by Qin Leng. Sara O'Leary is a writer of fiction for both adults and children. She is the author of the award-winning series of Henry books -- When You Were Small, Where You Came From and When I Was Small -- and This is Sadie, all illustrated by Julie Morstad, and You Are One, illustrated by Karen Klassen. A graduate of the UBC Creative Writing Program, she has taught screenwriting and writing for children at Concordia University in Montreal. Qin Leng lives and works as a designer and illustrator in Toronto. She has published numerous picture books in Canada, the United Kingdom, the United States, France, Sweden, Hong Kong and South Korea. She has also illustrated for Save the Children and UNICEF.